BELIZE CITY, Fri. May 8, 2015–As we reported about a month ago, forecasters Philip J. Klotzbach and William M. Gray of the Department of Atmospheric Science at Colorado State University have predicted a much quieter hurricane season for the Atlantic Basin this year, and their April 9, 2015 forecast calls for a total of only 7 named storms, 3 hurricanes and 1 major hurricane. While the season is expected to show below average cyclone activity this year, it has gotten off to quite an early start, with the first named storm of the 2015 Atlantic Hurricane Season—which normally spans from June to November—emerging Thursday night off the coast of Florida, USA. Ana is expected to strike the US east coast on Sunday with tropical storm force winds and rains before it heads back out to sea over the weekend. 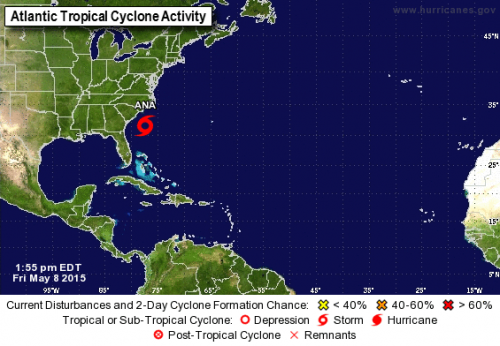 The subtropical storm is forecasted to impact North and South Carolina over the course of the next few days. Last year, the first named storm of the hurricane season, Arthur, formed on July 1, a month after the official start of the season. Storm names for 2015 are Ana, Bill, Claudette, Danny, Erika, Fred, Grace, Henri, Ida, Joaquin, Kate, Larry, Mindy, Nicholas, Odette, Peter, Rose, Sam, Teresa, Victor and Wanda. Whereas Belize experienced below normal rainfall during much of the 2014 rainy season, this year is projected to see more rainfall. 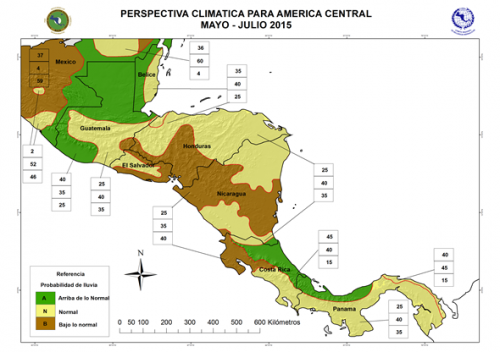 The 2015 precipitation data prepared for the Central American outlook forum and issued by the National Meteorological Service calls for a 40% chance of normal rainfall and a 35% chance of above normal rainfall along coastal Belize for the months of May, June and July, but a 35% chance of normal rainfall and 40% chance of above normal rainfall for the north, interior and extreme south of Belize for the same period. At the end of May, the Caribbean Climate Outlook Forum should be available. The National Met Service plans to release a full season outlook on June 1, 2015.